Good morning dolls and happy Monday! It is raining here in Orange County and my thoughts are with my kids who I hope are toasty and dry in their school classrooms. When it rains, I just want my kids home with me. I want to fix them hot cocoa, get them in their PJs, and let them watch their favorite shows all day. I still find it so hard to let my kids go and I worry about them all the time. Please tell me I am not the only parent who feels this way? I would consider homeschooling but the kids love their school and it would be so hard to work from home. LOL! How was your weekend? We had a great weekend as a family. I took my kids thrift shopping and we left the shop with some amazing finds that I can’t wait to show you. 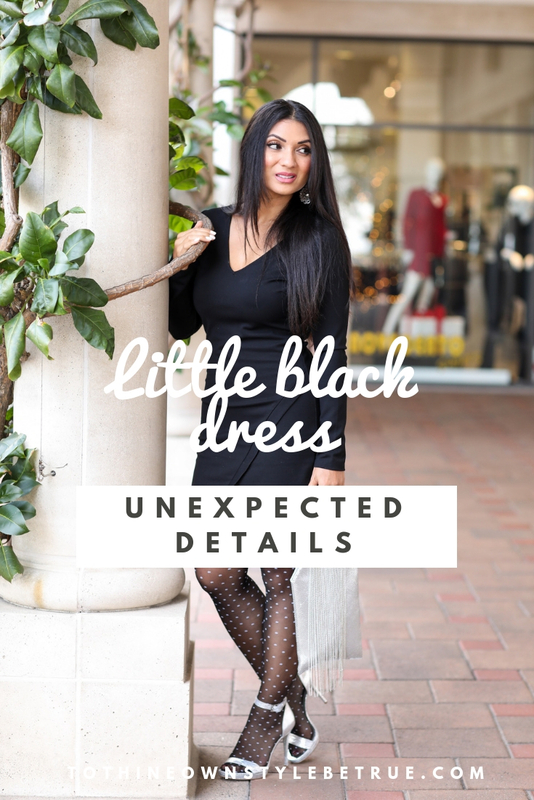 Today’s post is about the unexpected details with a little black dress (LBD). I could have kept this evening look simple but I couldn’t help myself so I added some surprises. With it being winter, it was a no-brainer to add hosiery to my look. The white dots on my tights deliver a whimsical twist to this familiar little black dress. I love that it makes a big statement against the solid dress color. I also decided to wear open toe strappy heels in metallic silver to showcase the dots hose all the way down to my little piggies. There once was a time that exposing your hosiery at the feet/toe area was a fashion faux pas, but now this is a styling technique embraced by some, but not all. What do you think of it? When it comes to wearing your LBD for your next event — don’t be afraid to think outside of the box. Adding unusual details such as textured hosiery with open-toe heels or sporting a unique handbag or statement earrings, or combining all of this accessories to one color family (which, in my case, is silver metallic) will definitely set you apart and easily update the look of your traditional LBD. Thank you so much for stopping by and spending a bit of your Monday with me. It means a lot. 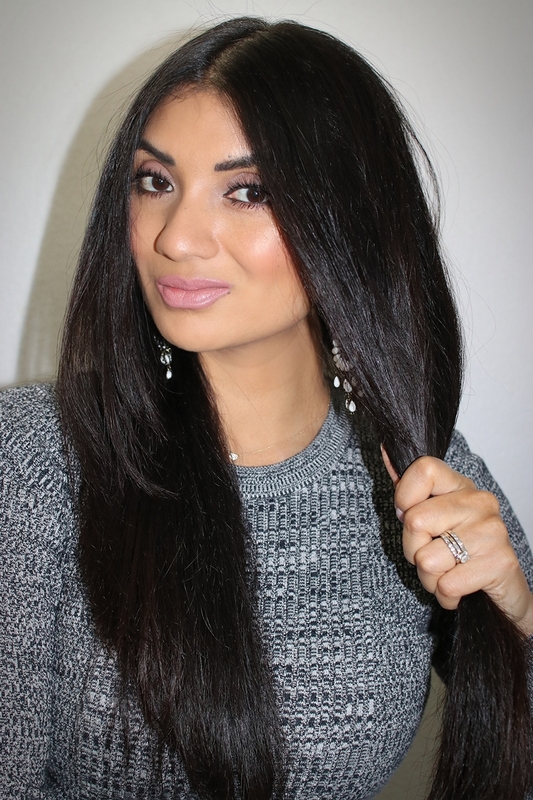 Next Post The Best Red Lipsticks To Try + Sephora $500 Giftcard Giveaway! I love the shoes and the dress more than anything! Super cute and a simple idea for cocktail or date night! I love the uneven hemline of that dress. It gives the dress a little something special without taking away from the simplicity of the plain neckline. Love it! I love the idea of pairing silver and black! It adds some visual interest without being too crazy colorful. I love that dress… And the dotty tights are great. Not sure I personally would wear open toe sandals with tights but that’s probably just me! I feel the same way about sending mine to school! I know they love it, and I love their school and teachers, but sometimes I wish they were home. Then again, I don’t think I would do well with homeschooling. I really like the look of tights with this dress. I don’t think I would have ever tried it, but seeing it on looks amazing! OMG, this outfit is gorgeous, you can never go wrong with a black dress. This is one is perfect and the stockings are to die for. This is such a gorgeous dress. I use to have a LBD but then I got organiza and it never fit right after that even though I went back to my original weight. I have yet to find another one that I like. This whole outfit just works together. Love it. Your tights are so cute. I would have never thought to pair those together but I love the combo! That dress looks like it was made for you, and I love your tights and shoes as well! You look fab! I love that dress and your hair is gorgeous! Love lighting in these photos – and the spotty tights! That is a great way to jazz up a LBD! And I love the tights – and that they’re such a cheap amazon find! I may have to get a pair! LOVE the cute hose with open-toed sandals! I was always taught I couldn’t do that, but now that I see you pulling it off, I must try! No better way to wake up my boring LBD. Thanks for the tip!